Pembroke Dining Hall. 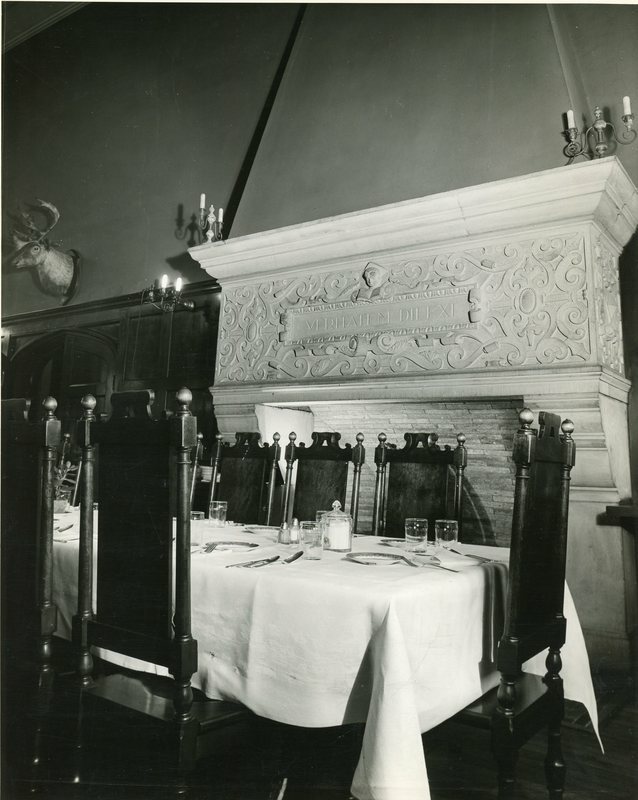 The carving in the mantle is the College's motto: Veritatem Dilexi (I have chosen truth). Social protocol surrounding meals and dining was explicitly outlined in the guidelines for each dorm. Each dorm had its own dining hall, kitchen, and dining staff. Student were expected to participate in communal meals and had to recieve special permission from the warden in order to dine in their own rooms. Special accommodations had to be made in order for anyone outside of the dorm community to attend a meal. For example, if an undergraduate living in Pembroke wanted to invite a student living in Radnor to dinner, a special invitation needed to be signed by the warden of Pembroke, and the warden of Radnor must also be notified of the absence of the undergraduate (Radnor Hall Rules). How can we think of the dining halls as sites of cultural consumption? How does this interrupt/alter domestic expectations of labor surrounding meals?